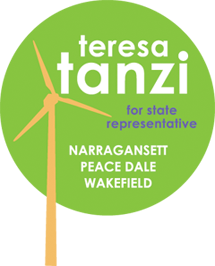 SOUTH KINGSTOWN - An advocate for tax fairness and a believer that small business can thrive in Rhode Island, Teresa Tanzi, a Democrat, will be taking on incumbent Rep. David Caprio (D-Dist. 34, South Kingstown, Narragansett) this September in her candidacy to represent southern Rhode Island towns through fiscally volatile times. When it comes to speaking to the State House on the behalf of South Kingstown and Narragansett residents, Tanzi’s priorities lie within fairness in regards to taxes. “The first and foremost thing that I will bring is fairness in taxation policy,” she said, mentioning that she’s been an advocate the past few years for fair tax policy, stemming from the alternative flat tax. Tanzi said that when the General Assembly voted this year to eliminate the flat tax, it was an opportunity for the wealthiest in the state to have a tax credit, which benefited 0.17 percent of all tax filers, more than one-third of which are out-of-state residents. “I was in strong opposition to that, and I lobbied heavily at the State House for repealing that alternative flat tax,” she said, noting that her opponent, Rep. David Caprio, is a supporter of that tax. Tanzi said as a result of having tax cuts for the wealthiest, local property taxes were raised. “When you are giving tax benefits to a certain group, and then cutting aid to cities and towns, I feel that that directly leads to the raising of local property taxes and I would not at all be in support for that,” she said. She went on to say that the largest growth in number of income tax filers were those earning more than $100,000 dollars a year. Tanzi said the notion that our uncompetitive tax rate causes residents to flee the state is not true. As someone who has moved to Rhode Island from out of state, she said, there are a lot of things people look at when thinking about moving and opening a business, including quality of life. The candidate said she wants to look to revenue enhancements, and not further tax cuts for the wealthiest, to attempt to fix the state’s deficit. She said the solution is in searching for more sources of revenue and spending more wisely. “As far as the spending goes, sure we can cut here and there and find some savings, but we can no longer cut programs and balance this kind of a budget deficit on the backs of Rhode Islanders,” she said. Tanzi also proposed looking at the state expenditure report in an attempt to close the state budget gap. “This report outlines 211 expenditures that are written into tax codes, they’re not laws,” Tanzi said, “that equal $1.2 billion dollars. And there’s absolutely no oversight, there’s no analysis, that’s provided on these.” She said the report includes everything from mortgage deductions to exemptions for airplane parts. Tanzi also believes the fish stock needs to be balanced against the health of the fishing industry, a currently highly debated topic as federal regulations threaten to put Galilee fishermen out of business. She said in regards to the proposed ban on lobster fishing, everyone understands and will accept the notion that the lobster population has dwindled. “One camp says it is as a result of overfishing or over-harvesting, one camp says it’s a result of the warming waters and one camp will say it’s certain predators that have been allowed to come back to a healthier stock, and now they’re the predators that are eating the lobster,” Tanzi said. She said it’s important to understand what’s causing the problem before enacting a solution, and she doesn’t believe there’s a consensus on the cause of the declining lobster population. “I think the problem is more personalities at this point,” Tanzi said, mentioning that there has been plenty of research done on the issue. She said with the economic climate, there is plenty reason for people to be protective over their own interests. “There’s more, I think, that can be done,” she said. Tanzi is also a supporter of restrictions on zoning as it pertains to niche markets like gun stores, an issue South Kingstown wrestled with last year when the Town Council and Planning Board struggled over the language outlining the restrictions pertaining to a firearms store located in a commercial neighborhood (CN) district. The candidate said that while she understands the right to bear arms is fundamental, she sees location as a factor. Tanzi said there was “good enough reason” to restrict that zoning, mentioning the gun shop is very close to an elementary school. She mentioned she had been invited to Universal Firearms on Wakefield by the owner to meet some of his customers, and looked forward to doing so. Tanzi is active in many community organizations, including the South Kingstown Economic Development Committee and the Friends of Canonchet Farm.